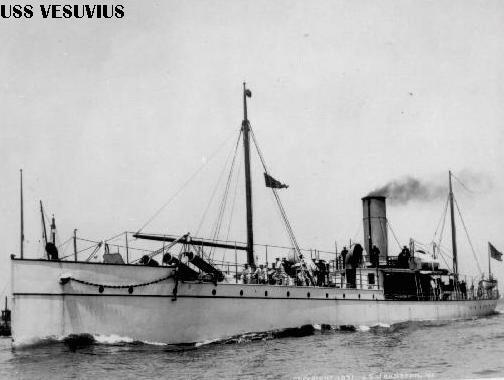 USS Vesuvius was perhaps the most unusual warship of the 1890's. Known as a "Dynamite Gun Cruiser", she combined a yacht-like hull with a trio of gigantic 15 inch pneumatic guns. These guns used compressed air to fire a shell loaded with "desensitized blasting gelatin", a mixture of nitrocellulose and nitroglycerine. The guns were built into the hull and could not be aimed except by varying the air pressure and turning the ship to point towards the target. 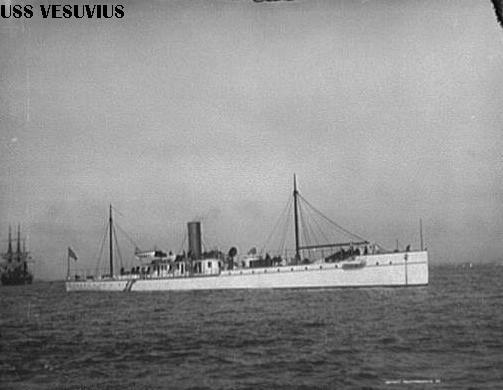 Vesuvius commissioned on 2 June 1890. It was quickly seen that the range of the dynamite guns was too short and that it was virtually impossible to aim the guns effectively, so the dynamite gun concept was abandoned. During the Spanish-American War the unusual ship served as a despatch boat and shore bombardment ship. Her gunsfire caused great terror ashore, since the pneumatic guns delivered shells without the warning usually provided by the blast of conventional weapons. 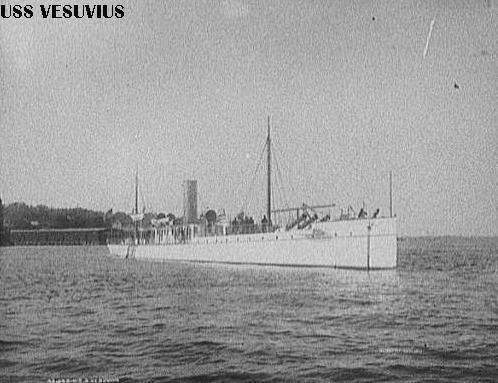 Vesuvius was converted to a torpedo test boat in 1904 and served in that role, based at Newport, RI, until decommissioned 21 October 1921. Photo Credit: Detroit Publishing Company Collection, National Archives. 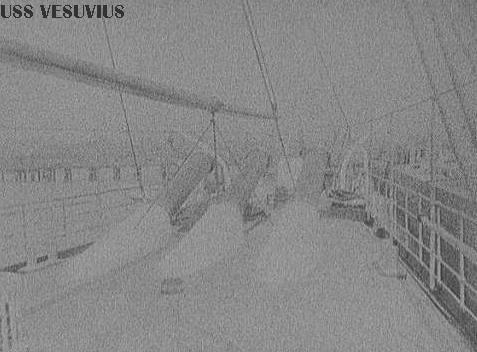 Vesuvius underway, port side. 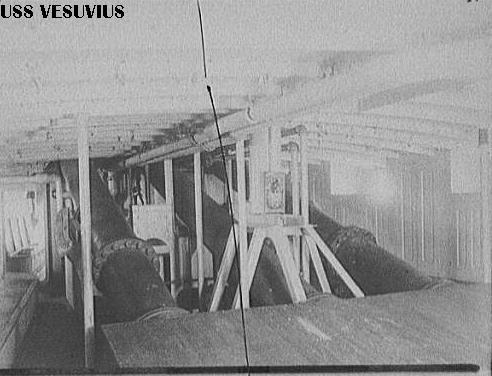 The muzzles of the three pneumatic guns can be seen projecting from the deck near the bow. 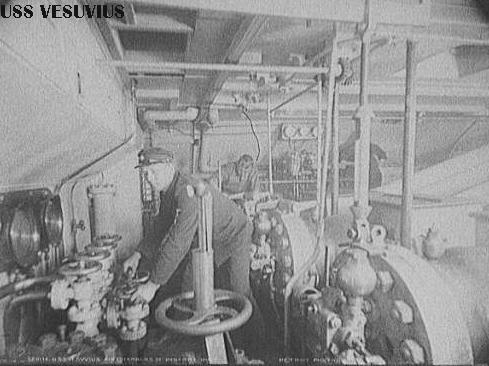 The gun breeches are deep in the ship directly below the bridge. Vesuvius, starboard side. The gun muzzles and small, yacht-like superstructure are clearly seen. Another starboard side view of Vesuvius. Projectile storage. 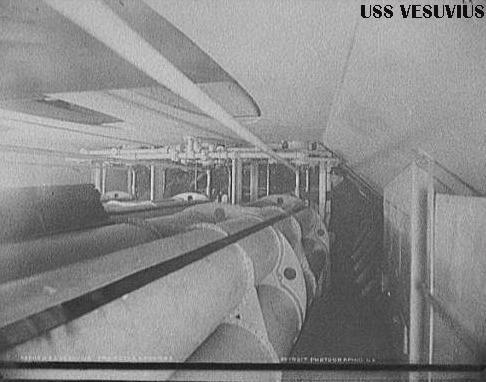 These tubes, deep inside the ship, apparently stored projectiles and transported them to the gun breeches. Air chambers. These chambers held the compressed air used to fire the big guns. The gun breeches, side view. 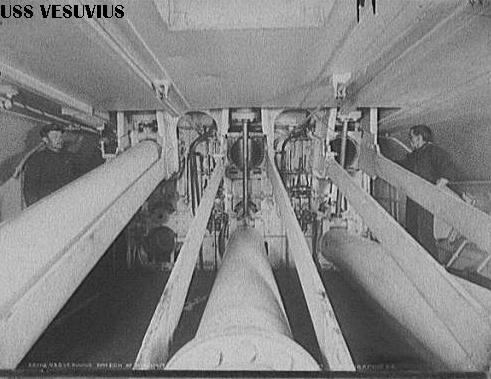 This view, from the starboard side looking forward, shows the three gun breeches and the projectile tubes extending forward. Gun breeches, rear view. Looking forward along the centerline. 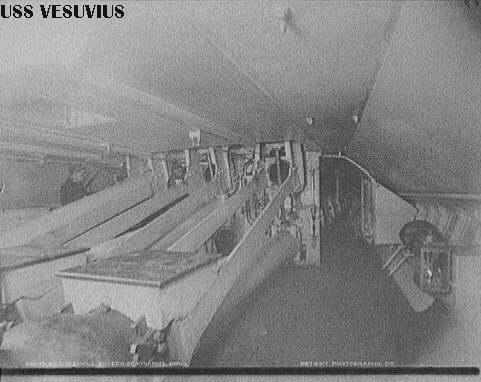 Gun barrels passing through the 'tween decks. View from the port side, looking forward. The gun muzzles. 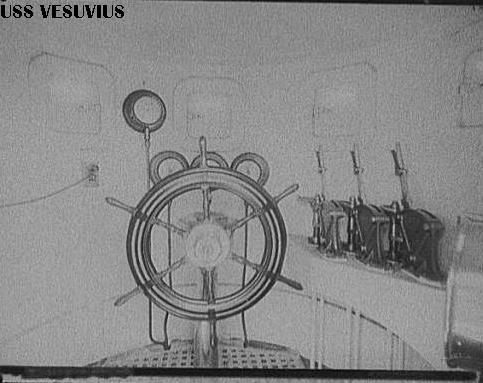 Taken on deck, looking forward towards the gun muzzles. The conning tower, interior view. The contrast with today's CICs could not be more striking.